Today's primary day in New York and Rep. Charlie Rangel is defending his Congressional seat with bad music. As soon as someone wants to reach young people, where do they turn? To hip hop. Or, more specifically, they start rapping. And the rap song, inevitably, will be the worst rap you hear all day, if not all week. Rep. Charlie Rangel is the latest to fall into this rap trap. (Haha! Lame.) Today’s primary day in New York and the same candidate who nearly beat him in the last election, State Senator Adriano Espaillat, is back and giving him a run for his money. Moreover, African-American voters who have historically been a solid base for him, may now be split with an up-and-comer, Rev. Michael A. Walrond Jr. Rangel’s seat doesn’t look threatened, but you never know how it will go when the votes are counted. Ask Eric Cantor. So in an attempt to be young and hip (Rep. Rangel is 84 years old and says this will be his last run for office), he’s enlisted someone to rap and it’s worse than that time Barney Rubble rapped about Fruity Pebbles. He was born in Harlem, got a Purple Heart and a Bronze Star earned them in the Army … graduated NYU and that was back in 1957 then he went to St. John’s and became a legal weapon. But putting aside politics (continue reading that article to learn more about both the demographic and political shift that’s occurring and this one to see how things stand today), there’s the question of whether this is the sort of thing that will appeal to a target audience. Short answer: No. 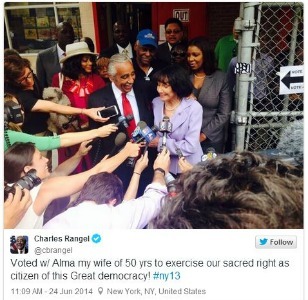 One of Rep. Rangel’s trademarks, besides his immaculate hair, is his gravelly wonderful voice. Someone else is doing the rapping, so it takes away from the thing that the candidate is most known for. Besides that, just putting something to a hip-hop beat isn’t going to attract a target audience — young, African American/”urban” or whatever — no matter what audience it is. In this case, it’s just not the right fit for this candidate. But as a general rule, rapping does not mean that the kids will come running.